The Steel City. The City of Bridges. Pittsburgh. No matter what it’s called, millions worldwide call it home. For those who were born there, live there now, went to school there or just a fan of the winning sports teams, Wendell August’s Pittsburgh’s Grand View skyline ornament will be a treasured addition to the Christmas tree. Created in partnership with Pittsburgh’s Painter of Memories, Linda Barnicott, Pittsburgh’s Grand View holiday ornament is part of a limited-edition collection highlighting the best of the city. Residents and fans alike can proudly display Pittsburgh pride on the Christmas tree or as a keepsake displayed all year long. The elegantly-etched, 3.5″ round, hand-hammered aluminum ornament highlights one of Pittsburgh’s most recognizable and breathtaking sights – the view of Pittsburgh from atop Mt. Washington. The back is stamped with its introduction date of 2014. The ornament’s textures and details have a vintage feel and a charm that will be cherished for years to come. A true work of art, a silky red ribbon tops the stunning Pittsburgh ornament. Since 1923, Wendell August Forge has been creating functional and decorative metalware built on the tradition of century old metalworking techniques. The oldest and largest forge in America, Wendell August pieces are handcrafted in our Pennsylvania workshop by artists, die engravers and craftsmen. From the signature of the die engraver hidden in the design, to the mark of the craftsmen hammered on the back, each piece is a celebration of American craftsmanship. From lifelong residents to those who simply passed through, the love of the city that brought us the movie theater, the gas station and of course, The Terrible Towel, lives in the hearts of many. With Pittsburgh’s Grand View skyline Christmas ornament from Wendell August, pride of the city can be displayed proudly on the Christmas tree year after year. THE STEEL CITY: Pittsburgh’s Grand View Christmas ornament pays homage to the Steel City by showing one of its most breathtaking sights – the view of Pittsburgh from atop Mt. Washington. Perfect for fans and residents to proudly display Pittsburgh pride. LIMITED EDITION COLLECTION: The artisans of Wendell August partnered with Pittsburgh’s Painter of Memories Linda Barnicott to create a stunning collection of limited-edition Pittsburgh ornaments highlighting the best of the city. AUTHENTIC CRAFTSMANSHIP: Wendell August’s Pittsburgh’s Grand View Christmas Ornament is handcrafted by artists, die engravers and craftsmen. It is made of hand-hammered aluminum with exceptional details of the iconic view of Pittsburgh from atop Mt. Washington. 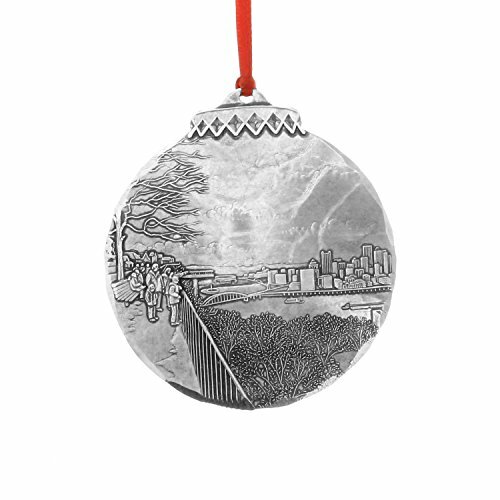 PERFECT TO GIVE OR RECEIVE: Pittsburgh’s Grand View holiday ornament is 3.5″ round aluminum. Its textures and details have a vintage feel and a charm that will be cherished for years to come on the Christmas tree or as a commemorative keepsake. A RICH HISTORY: At Wendell August Forge, our expert artisans hand-etch original designs into a die. Each piece is then hand-wrought by skilled craftsmen, using an eight-step process with its roots in ancient metalworking techniques. Since 1923, proud to be handmade in the USA for life’s special moments.